﻿﻿Late registrations will be considered on a case by case basis. Please email greensboro@bellaballerina.com with questions about late registrations. CLICK HERE TO PRACTICE YOUR DANCE! 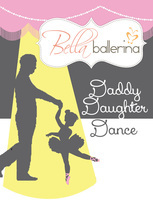 Our Daddy Daughter Recital Dance Number! Includes up to 4 practice times and special flowers from dad to daughter! Dads only need to attend 1 practice & dress rehearsal to participate. Girls wear their costume and dads wear black pants and white button down shirt. Grandfathers, brothers or uncles are welcome to stand in as long as they are at least 16 years old $50/child $20/additional child – your enrollment in the dance also serves as dad’s ticket to the show!